The placement of the bridge on an acoustic guitar is determined by the instrument's scale length. Correctly positioning the bridge is essential for good intonation. 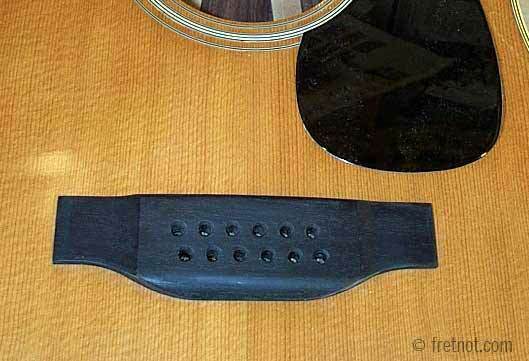 When the bridge, or it's saddle, are not placed correctly the instrument will not play in tune up and down the neck. 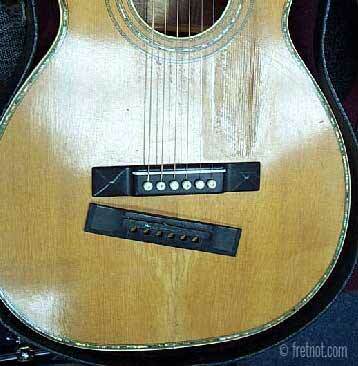 I have looked everywhere for a replacement bridge for my vintage guitar and can't find them anywhere. Nearly all vintage bridges I replace are made from scratch. Changes in design or material usually make it impossible to purchase a ready made replica bridge for many vintage instruments or those that are no longer in production. Brazilian Rosewood, which was frequently used on older instruments, is no longer used by larger factories and must therefore be made by hand. It should also be said that even if one could find an actual vintage bridge for purchase there is no guarantee that it will be an exact match. Due to the amount of hand craftsmanship that was used in the past, they are not all the same. I do not offer to make bridges as a retail product for purchase, I only make those I install. Gibson AJ with replacement bridge featuring a set saddle. Note the amount of hardware this eliminates. Some bridges were made with adjustable saddles that used screws to raise and lower the saddle for quick and easy string height adjustments. Although the concept is quite user friendly, they lack good coupling as they create a gap between the bottom of the saddle and the bridge. In order to improve tone and quality these are replaced with a handmade replica bridge that uses a traditional drop in saddle. 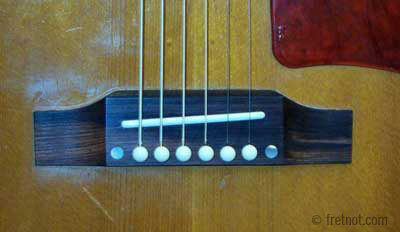 Porcelain adjustable saddle removed from Gibson guitar. 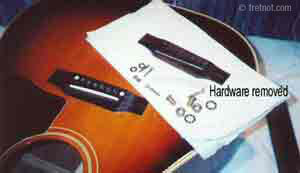 Another popular Gibson design was the hollow plastic bridge, held to the top with screws. These offer the top no support/bracing and more often than not, warp and crack. The Gibson LG-0, LG-1 and other models which used these plastic bridges usually have ladder bracing (not X-bracing) and spruce bridge plates. This combination can eventually lead to top rotation which causes a hump beneath the bridge. Read more about these plastic bridges on my blog. Unfortunately the only time I can use a pre-made bridge is when the exact same design is still being offered by the factory today. This obviously reduces the cost of bridge replacement so when an exact replacement bridge is available it is used. Does the bridge effect tone? The bridge is a top brace, albeit an exterior one. 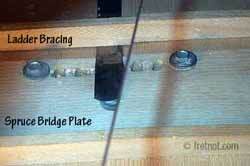 A loose bridge weakens the structural integrity of the top and can affect the tone as a result of the poor coupling. An overly thin bridge also changes the dynamics of tension/torque placed on the top and the distance of the strings from the soundboard. Although aftermarket pre-made guitar bridges are available from various sources they are not all identical to the originals they copy. If there is any variance in footprint, thickness, saddle position or bridge pin spacing they become a very poor choice for repairing valuable instruments. Epiphone Texan Conversion from adjustable.